2018 was a huge year for space-related science. We've compiled a shortlist of our favourite moments. 2018 was a year for incredible space exploration. Both governmental agencies and private companies overcame challenges to make a series of incredible achievements that will ensure 2018 as the year that space entered a new era. Falcon Heavy and StarMan SpaceX successfully launched Falcon Heavy in February this year, paving the way for Musk’s ambitious plan to send a manned mission to Mars. The rocket also made another kind of history by carrying Elon Musk's own Tesla Roadster into space. The car was even equipped with a driver, namely a mannequin wearing a SpaceX space suit listening to David Bowie’s classic track Space Oddity. The Parker Solar Space probe is named after Eugene Parker, a physicist who first proposed the idea of solar wind back in 1958. The probe was launched from Earth on August 12 and recently completed its first close solar flyby snapping pics of the sun, closer than any spacecraft has gone before. -How is the Sun's outer atmosphere, the corona, heated to temperatures about 300 times higher than the visible surface below? -How is the solar wind accelerated so quickly to the high speeds we observe? Japan's Aerospace Exploration Agency (JAXA) deposited two robotic explorers on the surface of asteroid Ryugu in late September. The two small robots named Rover 1A and Rover 1B will use onboard equipment to measure temperatures and take images of the asteroid's surface. The Ryugu astroid is 300 million kilometers from Earth. Bepi Colombo was launched on October 20 from Europe's Spaceport in Kourou. A collaboration between Europe and Japan, the spacecraft is headed towards Mercury on a fact-finding mission. Two orbiters will observe Mercury during the mission and send back complementary data to Earth. The mission hopes to understand more about the planet's internal structure, the nature of the surface and the evolution of its geological features. The Mars InSight Lander launched from Vandenberg Air Force Base in California on May 5, 2018 and touched down on the surface of Mars on Nov. 26, 2018, at 11:52:59 a.m. PT. Unlike other Mars explorers InSight won’t be traveling across the planet's surface, instead, it will bunker down and insert a probe deep into the planet's surface to gather never seen before data. The prob will begin science data collection about 10 weeks after landing. As part of the United States President's Space Directive 1, NASA is directing resources back to a manned moon mission. However, unlike in the past, the mission will be assisted by external private partners which NASA will use in a pay for service fashion. The partners that will help get Americans back on the moon include: Astrobotic technology, Deep Space Systems, Draper, FireFly, Intuitive machines, Lockheed Martin, Masten Space System, Moon Express and Orbit Beyond. After traveling for more than two years NASA’s Origins, Spectral Interpretation, Resource Identification, Security-Regolith Explorer (OSIRIS-REx) spacecraft arrived at its destination - Asteroid Bennu, earlier this month. 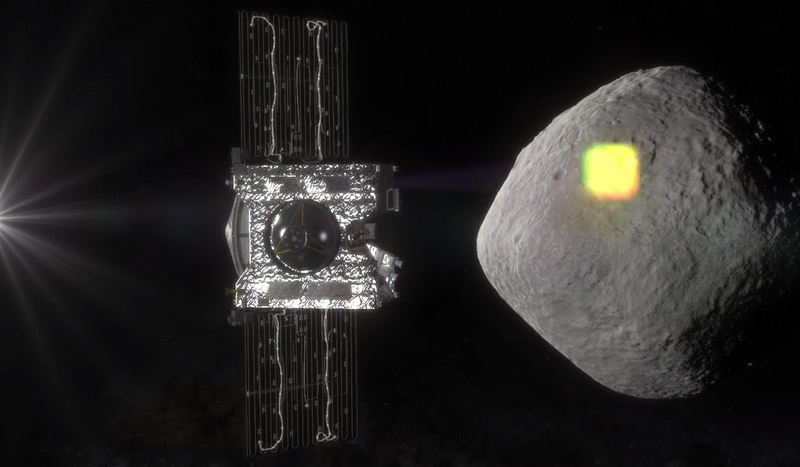 It is already sending good science data back to mission control with evidence that the asteroid once had contact with water. The spacecraft will continue to send observations back to NASA HQ before reaching out with a mechanical arm and taking a sample that it will be back to earth in 2023. Virgin Galactic VSS Unity Flight Richard Branson and his Virgin Galactic company made history this year when it successfully tested the first spacecraft designed to carry passengers into space. The successful mission means the first ever space tourists may be strapped for a maiden journey in early 2019. While many have criticized Branson for pursuing such a wasteful and dangerous idea, Branson himself believes he is opening Space up for the masses. In addition to the headline grabbers, there were lots of smaller breakthroughs and records set in space this year. For example, SpaceX rival, BlueOrigin had their BE-4 engine been chosen by United Launch Alliance for the use in the Vulcan rocket. The selection of the BE-4 by ULA means the company will no longer need to use the Russian made RD-180 engine. The Vulcan Centaur rocket is due to launch in mid-2020. “Vulcan Centaur will revolutionize spaceflight and provide affordable, reliable access to space for our current and future customers,” said Tory Bruno, ULA’s president and CEO. Another company making waves is the space startup Rocket Lab. The innovative company wants to open up the CubeSat market by offering regular launches at a range of price points. Rocket Lab has teamed up with NASA and launched the first of a series of NASA payloads earlier this month. China also made its mark in space news. It has unveiled a model of its planned permanently crewed space station. The ambitious project was shown off at Airshow China, the country's main aerospace industry exhibition earlier this year. Called Tiangong or "Heavenly Palace" the space station will be the only working floating lab in space once the ISS retires. Finally, NASA’s Voyager 2 Probe made history again when it reached interstellar space earlier this month. The space probe, originally launched in 1977, has traveled well beyond its original planned destinations. The Voyager is the second man-made object to have traveled this far. The Voyager 2 probe officially left the heliosphere – the protective bubble of particles and magnetic fields created by the Sun earlier in December. According to Nasa's reports, Voyager 2 is some 18 billion kilometers away from Earth. Mission control can communicate with the probe, but information traveling at the speed of light takes around 16.5 hours to travel from the spacecraft to Earth. To put that into perspective, light from the sun takes about 8 minutes to travel to Earth. 2019 looks like it will be another huge year for space-related breakthroughs. SpaceX is expected to continue to work towards their goal of manned Mars missions while governmental agencies from across the globe have ambitious plans for spacecraft, exploration, and experiments. Stay tuned!